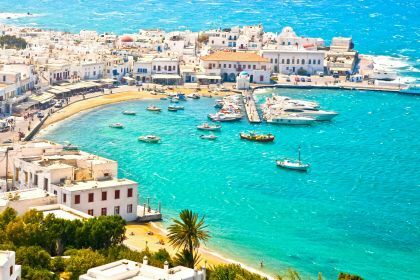 Everyone has to visit the famed party island of Mykonos at least once in their lifetime, and more than once is highly advisable. The luxurious destination draws its fair share of sybarites and VIPs; such as Leonardo DiCaprio, Mel Gibson and Stefano Gabbana. 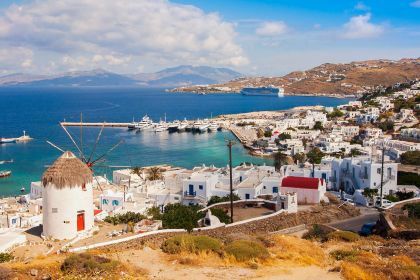 Santorini and Tinos are other essential stopovers while exploring the fabulous Cyclades. Call us or leave your charter enquiry here. Discover Mykonos, the jewel in the Aegean’s crown. Tap into the glamour and fun of the famed party island and marvel at the rugged beauty of the Cyclades. The Aegean Sea is eternally appealing. Think aquamarine water, dazzling sunshine, wind fanning the sails of your luxury yacht… These elements all add up to offer one of the world’s sailing hotspots. Its charms are seldom found beyond the Mediterranean Sea, of which the Aegean is a part. 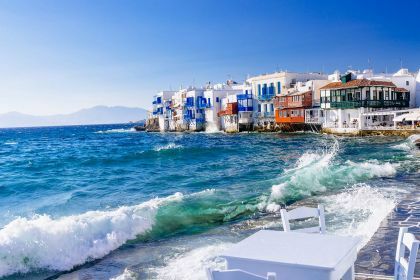 Mykonos is the jewel in the Aegean’s crown and the pride of the Cyclades Islands (the group of islands southeast of the mainland). Mykonos is characterised by its white houses and signature windmills. It manages to combine down-to-earth charm with luxury and glamour and, in the 1960s, was the island favoured by Jackie Kennedy and her Greek billionaire husband Aristotle Onassis. Today, it still draws international celebrities and jet-setters who are lured by its charms. Many wealthy Greeks own homes on Mykonos and vacation here in the summer. The island is also known for its liveliness and exuberance. Both day and night, life on Mykonos is fun and energetic, with ample live music, clubbing and groups of beautiful people enjoying the good life. It is known as the Greek ‘party island’, and never really sleeps. Think massive beach and dance clubs, thumping beats and some of the world’s best DJs. If you’re up to the party challenge, hit Cavo Paradiso, Paradise Beach Club, Skandinavian Bar or Jackie O, or book a table at one of the exclusive, high-end hotspots such as Nammos, Moni Club, Camares, Astra or Guzel. Mykonos is not just about a good party though. There’s a huge selection of outdoor and cultural activities to choose from when you’ve had your fill of carousing or simply prefer the quieter life. If you want to go kitesurfing or windsurfing in Mykonos, head for the southern side of the island. The best beaches for surfing are Kalafatis, Korfos, Ornos and Platis Gialos. Diving is also a popular option. Multi-coloured fish and fascinating shipwrecks offer great rewards for the underwater explorer. For horseback riders, there are wonderfully picturesque trails to explore. For lovers of culture and history, there are seven museums on the island to keep you occupied. Also on offer is the archaeological site of Delos — the biggest open-air archaeological site in Europe and the mythical birthplace of Apollo and his twin sister, Artemis. If you’re in the mood to shop, head to Matoyianni Street. There’s a vast selection of all sorts of merchandise to update your wardrobe, treat your partner or loved one to a lavish gift or just buy a little memento to take home. 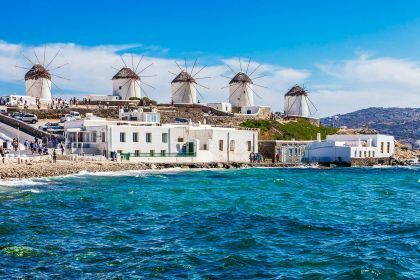 While in Mykonos, don’t miss out on the opportunity to admire the island’s 16th-century windmills (Kato Milli). It’s truly one of the highlights. Include magnificent Mykonos and the picture-perfect Cyclades Islands on your sailing or motorboat itinerary. Tap into the glamour and fun of the famed party island and marvel at the rugged beauty of the Cyclades. Choose from the featured luxury yachts below or contact your friendly Abberley charter broker to plan all the details of your next idyllic charter holiday. You can call us or leave your charter enquiry here.